The old 46-acre Solvay Coke plant site in Milwaukee (#SIA2005 annual conf. 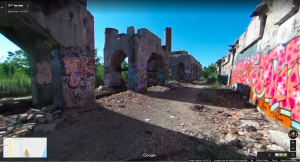 tour stop) is to be redeveloped by Komatsu as what is being touted as the “largest urban manufacturing development ever proposed in the United States.” For recent developments, see articles on Urban Milwaukee and the Milwaukee Journal-Sentinel. The previous coking industrial heritage of the site is long-decayed and now mostly all removed. Solvay closed the plant in 1982 and We Energies later acquired the land, but apparently made no attempt to secure the grounds or buildings. Most of the buildings and the coke ovens have been demolished since SIA visited them in 2005 (I was on the tour and seem to recall that the tour guide said that they were coming down shortly) and the office and factory buildings that had been recently standing had been heavily vandalized and tagged with graffiti, as numerous snapshots on Google Maps will show (If you go to that link, face south, and then expand the map inset to the lower left, you will see dozens of static snapshot dots which you can move your little GoogleMapsMan onto to see the former state of the buildings).